Conex-PL is a knowledge-based scoring function for protein-ligand interactions. We suppose the interaction potential to be decomposed into a polynomial basis with expansion coefficients that can be found from a knowledge base with a convex optimization procedure. To do this, we assume that for a set of interaction sites located on the protein and ligand atoms, there is a linear functional dependent from the pairwise distances between the sites that indicates whether a configuration of a receptor-ligand complex is a native or a non-native one. The linear functional itself takes a simple form of a scalar product between a features “structure” vector and a scoring vector. Extraction of geometrical features, or the site-site distance distributions. For the typization of atomic sites we use our recently developed Knodle tool. These continuous features are projected into a set of discrete features. A Support Vector Machine quadratic optimization problem is solved to find the interaction potentials in form of a scoring vector. 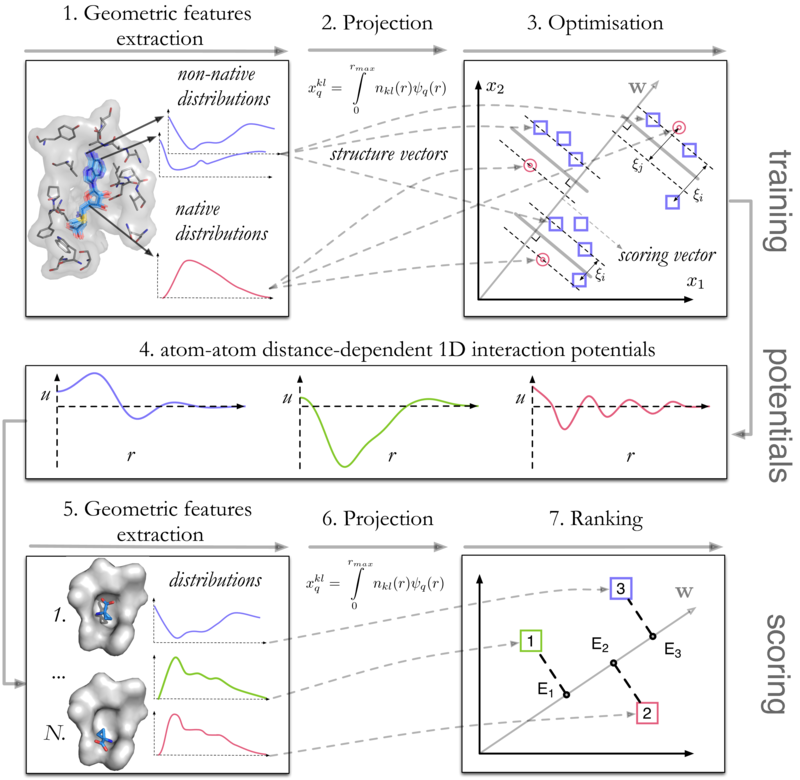 To score an unknown configuration, a vector of its geometrical features is multiplied by the scoring vector, resulting in a relative binding energy prediction. Figure 1. Schematic representation of the training stage (top) and the scoring stage (bottom) of the method. Method validation was done on the Comparative Assessment of Scoring Functions (CASF) 2014 benchmark. It included four tests that were already applied for 20 popular scoring functions assessment by the benchmark authors. Compared to those 20 scoring functions, Convex-PL showed the best result in pose prediction, 5th result in the scoring test and 1st in ranking. Nevertheless, its results in the screening test representing the virtual screening tasks, which involve higher diversity of chemical compounds for each target receptor, were average.